Many things contribute to a low trailer deck, and often they conflict with other needs for the trailer. Here is a list of ways to build a lower trailer deck — and some potential trade-offs for doing them. This list is not complete by any stretch, but it covers the big ones. Please add your insights in the comments. As you read about ways to achieve a lower trailer deck, please keep this question “Why do I want a Lower Trailer Deck?” in the back of your mind. Sure, it seems obvious, but sometimes our focus on advantages blinds us to a potential oops. We discuss Value and Hiccups in this post. When planning a new trailer, you can do a lot to minimize the trailer deck height. This list has several options, so pick those that fit your needs, then customize the plans. On the other hand, to lower an existing trailer, some options won’t work. We have a * by items in the list that work for retrofit. Also, please note that some items combine for added effect, while others are mutually exclusive. Not all axles are the same, and some types definitely have advantages for lower deck height. Also read Axles 101. There are many axle types, but we’ll discuss 3 here. Leaf Spring style axles have an axle beam that extends across the trailer. The design of the frame is typically above that beam with clearance to allow suspension travel. Many options exist for height — like Overslung vs. Underslung; Drop (see below) vs. Straight; Spring Length and Spring Arch; Height of Spring Hangers (see below); etc. We’ll let you research more on the details. Torsion Axles (typically) are also located under the trailer frame, but they attach directly to the frame which does not require suspension travel allowance. Typically, torsions with neutral angle up give the lowest practical mounting. See below because some other tricks exclude torsions. Axle-Less suspension mounts independently on both sides of the trailer with (usually) no extra connection across (other than the frame members). Read more on Axle-Less Suspension. Drop axles are often associated with leaf springs, yet many types have a variation of “drop”. Torsion Axles have a neutral angle UP, or DOWN, or Zero. Using a neutral angle UP effectively gives a “drop”, though not as much as 4″. However, because they attach directly to the frame and don’t require suspension travel allowance under the frame, these can achieve a low trailer. Other axle types have mounting height options too — like Torsion axles come with either high and low mounting brackets. Tires for the trailer are a big deal. In general, the smaller the tire, the lower the trailer deck. However, bigger wheels and tires will typically carry more. Choosing tires is a balance — for a lower trailer deck, you want smaller diameter tires, but they must have capacity for the load. Also smaller tires turn faster, so they can wear bearings more, and smaller wheels don’t allow as large a brake. Choose wheels and tires for load capacity first, then think about size. If they won’t hold the load, then how does size even matter? Explore both trailer specific tires and automotive tires. Sometimes more plies allows a little smaller tire. Sometimes a wider tire allows a smaller diameter. And, sometimes you can go to a larger wheel with a lower profile tire for equal capacity. Lots of choices exist, but many yield only a marginal height reduction, so do your research. Most trailers have the deck material on top of the frame. One option for lowering the deck is to recess the deck into the frame. Most of the Mechanical Elements utility trailers have the deck partially recessed into the frame so the deck top surface is even with or slightly below the main frame beams top surface. For an even lower trailer deck, consider placing the crossmembers under the main frame rails. As in this image, the deck here is definitely lower. The trade-off is the also lower crossmembers and potential spacing issues with axles and springs. Tiny House Trailers have special needs for a low deck. They also have some unique needs in the frame (space for water, waste, insulation and wires) that make some ideas less practical. Looking at typical Tiny house floors, there are definitely opportunities for lowering the total floor height by integrating it into the frame. Ideas about this are in the article on Tiny House Trailer Plans. A more complex trick places the axle mounts off the main frame rails. We see this in the automotive world, like on trucks with leaf springs. However … off-the-shelf trailer suspension parts space a little different. Be careful to assure adequate strength, and room for suspension motion (movement up and down). You really don’t want the axle to hit the frame! If the trailer is long, then it might require taller main beams — which increase trailer deck height. 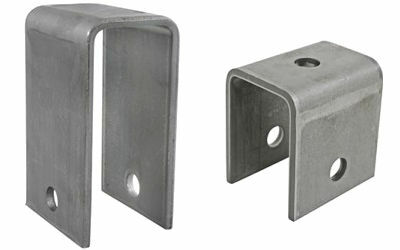 If space is available, the axle mounts might be placed just off to the side of the main beams, vertically up a little. That allows the main beams to pass on the side of the suspension rather than being right over the suspension. Note this trick works with some leaf spring axles, and with some applications of axle-less suspension, but not with torsions. Again, this is a complex option. Some trailers lower so the deck is nearly on the ground for loading, then raise up for travel. Here’s a search that shows several things other people have done. Choices that we make with the frame and with components usually have trade-offs. Considering the advantages and potential hiccups of those choices is a balancing act. As you work toward a lower trailer deck height getting the choices right will make a big difference in the pleasure of ownership. Next up, read about the Value and Hiccups of low trailer deck height. Or read about how to Make a Trailer Wider. Thank you for visiting.